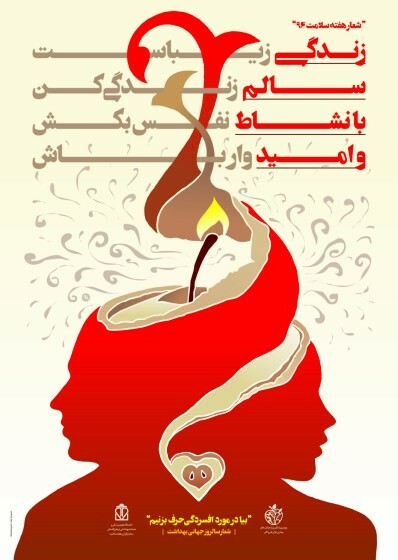 Saleh Zanganeh, a young designer from Iran, recently sent me a poster he designed for Iran National Health Week with the slogan "Healthy Life with Joy and Hope", a variation of the slogan for the World Health Day "Depression: Lets talk". To show them on the web I reduced all to the same size (560 px in height), using an online program for the animated gif and VLC Media Player for the mp4 file. What surprised me, was the good quality of the mp4, and also its small file size. The animated gif was of inferior quality, depending on the size reduction software. A gif file can only have 256 different colors which is often insufficient to show color gradients. Also, the movement doesn't seem as smooth as in the mp4, although it consists of 66 individual frames. However, animated gifs are usually shown on more browsers and older hardware than video formats like mp4. I have long been a fan of animated gifs. It is an old format, probably as old as the gif format, invented in 1987. It is easy to make an animated picture, I used it in an early edition of Posterpage to put falling snowflakes on the front page on Christmas day. There are some beautiful examples, it is still popular among students or pornographers, but looking at the samples below I think the format has now entered the realm of nostalgia. Everybody now has a video camera in his smartphone and making high-resolution animations is even easier than making gifs.